TrueBlock™ technology—guaranteed to cover everything underneath. 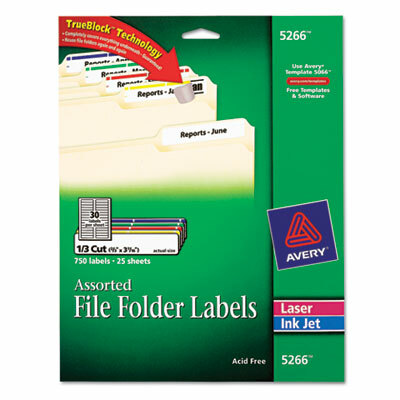 Create a coordinated look and organized file with these 1/3 cut, top tab file folder labels. Guaranteed to stick and stay without lift or curl! TrueBlock™ technology—guaranteed to cover everything underneath. Create a coordinated look and organized file with these 1/3 cut, top tab file folder labels. Guaranteed to stick and stay without lift or curl! Laser and inkjet compatible.